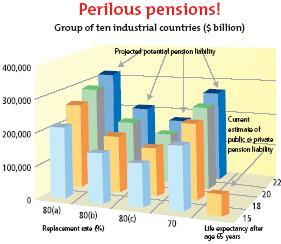 IIPM MBA - MBA Courses MBA Institutes Management Program: Perilous pensions! 1. Total liability based on the total annual wages based on the G -10 countries adjusted to reflect target replacement rates (X axis) and life expectancy after 65 years (Y axis). 2. Based on estimates of (i) total public pension liabilities (see Holzmann, Palacios and Zviniene) and (ii) private pension benefit obligations (OECD, Global pension statistics). 3. Replacement rate = retirement income as percentage of previous salary. • 80(a): liability based on 80 percent of previous salary, no one working beyond the retirement. • 80(b): 80 percent + 1/3 of the population over the age of 65 years working full time. • 80(c): 80 percent + 1/3 of population working over age 65 years full time and 1/5 of population over age 65 working part-time.